Many B2B businesses are looking to grow their business through direct B2C online selling channels. These businesses need to manage all their channels, whether B2B or B2C, on a common platform that provides business users tools with the capabilities to quickly create and publish engaging and seamless brand experiences across all digital channels, including mobile, with a reduced dependency on their IT department. The Aurora starter store in WebSphere Commerce is entirely written in jQuery, which is a commonly used in dynamic websites. The jQuery AJAX and events API provides a stress-free use of framework that meets most AJAX requirements for all storefront development. Why Migrate to jQuery Aurora Storefront? A store function is available to control whether dynamic E-Marketing Spots are loaded either server-side with the page, or loaded after the initial page load is complete, to better support Content Delivery Network (CDN) caching. Interactions in the category page are implemented using full page loads, rather than using AJAX. This strategy simplifies page coding and removes the complexity of handling the web browser’s back, forward, and bookmark features. jQuery framework comes tuned for better SEO, which essentially means that the business will not have to worry about SEO. jQuery open source library has plenty of prebuilt and stable plugins available to suite various business needs. It is cross browser friendly, so no development effort to maintain different codes bases for different browsers are required. The WebSphere Commerce AJAX framework is an extension of the jQuery AJAX framework. It provides an easy to use framework that meets most AJAX requirements for storefront development, and hides some of the complexity and repetitive code that a storefront developer often encounters. The AJAX framework helps determine the refresh areas of pages, and the content that populates them. The framework helps track the status of store pages, and the content that is generated when customers interact with the store. 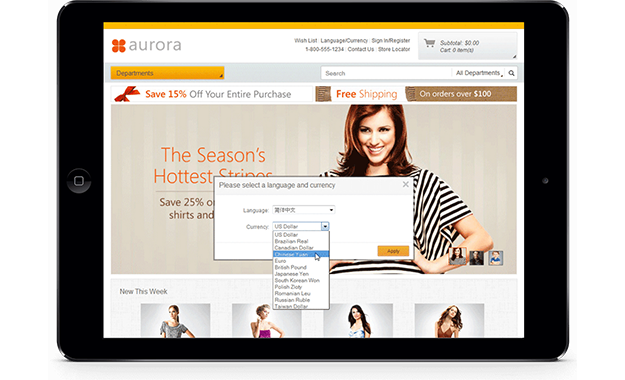 The user interface widgets in the Aurora starter store extend the functionality of available jQuery widgets to create a versatile, customer-friendly store. They add new functionality, changing the appearance and interaction experience in the store.